As one of the most popular plus size prom dresses of the season, there's no doubt that everyone is loving the peplum style! 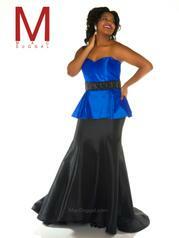 With a strapless sweetheart neckline, the stretch taffeta material wraps around the bodice for a comfortable fit. Around the waistline there is a beautifully designed belted look of stones that wrap around from front to back. The peplum skirt then extends forward from the waistline, making this dress a favorite for a pageant crossover piece or mother of the bride dress. Creating a mermaid silhouette, a full taffeta skirt then extends toward to the floor and creates a beautiful sweep train in back.